Presently available evidence points to Paxman entering the field of liquid/solid separation, commonly termed filtration, in 1933. This is at variance with another source, an article published in the June/July 1965 issue of the Paxman Bulletin. The article, written by Otto Berger, then Chief Engineer of Paxman's Chemical Plant Division, states that the Company's first Vacuum Drum Filter was made in 1931. Andrew Phillips has studied the Company's Board Minutes of the early 1930s which reveal a different picture. It was after the AGE crash in 1932, and the subsequent re-financing and re-construction of Paxman, that Edward Paxman and Percy Sanders, the Joint Managing Directors, proposed a new venture: taking up the manufacture of filters. It would not have been a new venture if the Company had already been working on such a product. In November 1932 the two Managing Directors sought Board approval to employ a Mr H J Talbot, an experienced filter engineer, on a three year contract. They also sought to appoint an Assistant Chemist, a Mr Clarke. Both Mr Talbot and Mr Clarke commenced with the Company on 2nd January 1933. The first documented filter order, No 18097, is dated 2nd May 1933 and the first picture of a filter in the Paxman photographic archive is also dated 1933. The Board Minutes, order record and photograph are compelling evidence that the decision to enter the filter business was not made until late 1932 and that the first filter was not made until 1933. A first-hand personal insight into the early days of Paxman's filtration business has been provided by Ralph Jarrett of Knutsford, Cheshire who contacted me in September 2012. Mr Jarrett joined Paxman in 1933 or 1934. He had completed the chemistry degree course at Imperial College, London but lacked any industrial experience and in the difficult economic conditions of the time was having no success in finding a first appointment. Mr Clarke, recently recruited as Assistant Chemist for Paxman's new filtration venture, had a serious health problem which severely limited his ability to fulfil his duties. Ralph Jarrett's father, Frank Jarrett, who had been appointed to the Paxman Board when the Company was reconstituted in 1932, became aware of this situation. He suggested that Ralph should offer to take on the chemist's job for three months with no pay, which he did. At the end of that year Mr Clarke's employment was terminated and Ralph was appointed in his place. According to Ralph Jarrett, Mr H J Talbot had approached Paxman claiming that he had 'a pocket full of orders' for filters, a product which Paxman could make. Mr Talbot was, or had been, employed by International Combustion which had developed rotary vacuum filters in addition to its normal boiler construction work. Thus it would appear that Paxman's entry into the rotary vacuum filter business was based on recruiting Talbot who promised to bring with him designs for such equipment and potential orders. Ralph Jarrett has described the situation he found when joining the Company, as it was preparing to manufacture filters: 'A section of Paxman's Tool Shop was vacant and this was fenced off and a test rig had been erected consisting of a steam-jacketed mixing tank, a 10 square foot rotary filter and trough, and two receiving vessels with extraction pumps. In addition an office and laboratory had been installed.' Ralph spent four years at Paxman, undertaking chemical analysis work and going out to customers' sites to commission plants, before leaving to further his career elsewhere. It was the rotary vacuum filter which was to become the mainstay of the Company's filtration business for nearly sixty years. A liquid which has solid particles (solids) suspended in it. The slurry is filtered to separate or remove the solids from the liquid. The material through which the liquid constituent of a slurry passes during filtration but which traps the solids. Typically this is a fabric cloth, fine mesh wire gauze or a layer of precoat earth. In laboratories the normal medium is purpose-made filter paper. The layer of solids which builds up on one side of the filter medium as the liquid in a slurry passes through the medium to the other side. The liquid which is left after the solids have been filtered out. Special considerations apply when liquid/solid separation is required on an industrial scale. All forms of filtration require some kind of force to induce a flow of liquid through the filter medium. For small batch filtration in the home or laboratory the force of gravity is often sufficient. For most industrial purposes it is impractical to rely on gravitatocess wouslow. One solution, used in what are termed 'pressure filters', is to apply pressurhe slurry to increase the flow of its liquid constituent through the filter medium. An alternative is to apply a vacuum to the underside of the filter medium and draw the liquid through. As its name implies, the Paxman rotary vacuum filter employed the latter method. Another important requirement for industrial applications is continuous operation. To achieve this the design engineer must devise an effective method of continuously removing the filter cake from the surface of the filter medium, and in some cases washing the filter medium, without having to stop the process. A number of methods or discharge modes were developed for removing the cake, as cakes have very different handling characteristics depending on the type of slurry being filtered. A short history of Paxman's Chemical Plant engineering was published in the June/July 1965 issue of the Paxman Bulletin. The article was written by Otto Berger, then Chief Engineer of the Chemical Plant Division. He noted the Company commenced this type of work in the early 1930s when filters were supplied for only four main purposes. These were the filtration of caustic lime (in the production of caustic soda), metal ores, coal, and paper pulp. He went on to say that during the Second World War the Chemical Engineering department had to curtail its activities because of war production. This seems at variance with a paper written in 1945 about Paxman's war production. Section C of the paper, entitled Chemical Engineering, records that wartime output included 'some 25 large filter plants built for chemical factories, collieries and distilleries'. 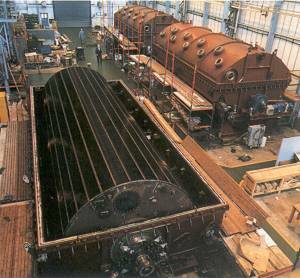 For the coal industry these plants comprised Flotation Machines used in conjunction with Rotary Vacuum Filters for recovering and dewatering fine coal. At Askern Colliery (S Yorkshire) alone, during the war, about 600 to 700 tons of clean coal were recovered per week using such plant. The 1945 paper also makes reference to rotary vacuum filters supplied to the chemical and papermaking industries. 1965 First Standardised Range of Drum Filters. 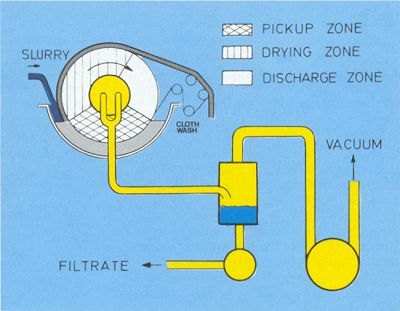 The introduction of a standardised range of vacuum filters in 1965, referred to above, was prompted by the need for some rationalisation. Presumably the need arose because so many variants had been developed during the preceding fifteen to twenty years to meet the special requirements of new applications. In 1970 the Company introduced plastic drums for rotary vacuum filters. Cast in epoxy resin, the drums were bought-in and because of their high cost only specified for use in a small number of highly corrosive environments such as the production of Glaubers Salts (sodium sulphate). They were relatively small. Although a 1980s Paxman booklet refers to sizes from 2.8m² to 6.5m², it is thought they were only made in two sizes. From the mid-1960s the Filtration Division was based in the West Building on the Standard Works site, close to Harsnett Road gate. Run as a semi-autonomous business, Filtration had its own engineering staff and drawing office, its own sales staff and a Filtration Laboratory. Manufacturing was carried out in the Fabrication Shop and the Filter Bay in the main Paxman works. Photo: De-waxing filters in build at Colchester. During the post-war period the corporate identity of Paxman's filtration business changed a number of times. A paper written in 1945 describes this part of the Company's activities as Chemical Engineering. In the late 1940s and early 1950s it was part of Paxman's Boiler & General Engineering Division (BGED). By no later than 1956 it was part of the Boiler & Chemical Plant Division which by 1962 had become the Boiler & Industrial Plant (BIP) Division. In 1969, when the remnant of Paxman's boilermaking activities was transferred to Newton-le-Willows, the name changed to Paxman Process Plant Division. In August 1987 the Division adopted a new identity as Paxman Filtration, a Division of Paxman Diesels Limited. It retained this name until being sold by Paxman in 1989. The values of Orders and Sales Turnover of the Filtration Division for each of the seven financial years from 1981/2 to 1987/8, as disclosed in annual reports to employees, are shown in the table below. * turnover affected by four month industrial dispute at Paxman during the summer and autumn of 1986. At some stage in the post-war period Peter S Gaul was General Manager of the filtration business. Mr Gaul retired in December 1956, although it has not been possible to confirm whether he remained in charge of filtration up to this date or who succeeded him. By no later than 1969 the General Manager was Tom Minta (known to be Sales Manager as at mid-1965), by all accounts an able and respected manager under whom the Division prospered. Tom Minta retired in June 1980, to be succeeded by Bruce Leggett who had joined Filtration in 1979 as Business Development Manager. In early 1983 Bruce Leggett was appointed Director of the newly-formed Spares & Service Division of Paxman's diesel business and Will Pavry took over as General Manager of Filtration. (Will Pavry had been appointed Manager of the Process Plant Division in December 1981 (1).) When Bruce Leggett was made Commercial Director of the Engine Division in 1984, Will Pavry succeeded him as Director of the Spares & Service Division. (Will Pavry left Paxman 1986, returning as its Managing Director in 1987.) His successor as General Manager of the filtration division was Cyril Smith, previously the division's Sales Manager. In 1988 Cyril Smith accepted the position of General Sales Manager with the Engine Division and that October Ian Mactaggart, then Filtration's Chief Engineer, was appointed in his place. He was Filtration's last Divisional Manager and quickly found himself responsible for, among other things, managing the move of the business to Severalls Lane after its sale to Brackett was concluded in April 1989. With a warm and amiable personality he found, perhaps to his own surprise, considerable satisfaction in the people aspects of the top job which included gaining the trust and cooperation of shop floor staff during an unsettling period. After Filtration's sale, Ian became Technical Director at Brackett, with special responsibility for the Paxman filter range. A key individual in the Filtration business's history was Otto Berger, Chief Engineer, who was in that post certainly by 1951. Under his leadership the Engineering function was very active, developing several new and improved types of filter. He left Paxman in 1972 to join Brackett, another Colchester filtration company, where he served as a Director for about ten years. In October 1972 Ian Mactaggart, at that time responsible for Service and Contracts, took over from him as Chief Engineer. Ian had joined Paxman in 1953 as a Student Apprentice and spent most of his career in its filtration business. Long service among the staff was by no means unusual. Between them, Don Page, Chief Design Engineer, Fred Appleton, Senior Applications Engineer, and Tony Warren, Chief Filtration Engineer, had over a hundred and twenty five years service with Paxman. Vacuum Disk Filters, which operated on very similar principles to the rotary vacuum filter. Mounted on a common shaft were a number of disks, each covered with a filter medium. The disks were rotated, partially submerged in the slurry, while vacuum was applied to the sections of each disk to draw the filtrate through the medium. The design's major advantage was its larger filtration area compared with a similarly sized rotary vacuum filter. Designed by the Automatic Coal Cleaning Company of Carlisle, ACCO filters were built under licence by Paxman. The first was made in 1954. Paxman's Colchester Newsletter No 9 , of August 1955, reported that a number of the new type Paxman rotary vacuum disc filters had recently been completed at Standard Ironworks. One application was the continuous dewatering of flocculated or froth-floated coal slurry. The last ACCO filter produced at Colchester appears to have been built in 1961 for Blidworth Colliery. Roto-Plug Sludge Concentrators, which were initially expected to attract large volumes of business for Paxman. The history and design of the concentrator are described in the next section of this page. Fruit Pulp Presses, designed for apple pressing, were an adapted form of the second stage compression filter used in the Roto-Plug Sludge Concentrator. Although the Company hoped they could also be sold for other fruit pressing applications, it is believed only one or two, possibly three, were made. Built circa 1959-60, these were for the Merrydown Wine Company. Horizontal Table Tipping Tray Filters, designed for dewatering very dense or granular materials and incorporating facilities for multi-stage washing of the filter cake. The circular tables of the small 10 sq ft versions were approximately 12' diameter and of the larger 30 sq ft ones about 20' diameter. In terms of price per square foot of filtration area they were expensive machines to build and not many were made. Customers included Carborundum of Manchester (two ordered in 1961), Norton Abrasives (1964 and 1973), ICI Dumfries for handling sodium carboxy methyl cellulose (1962), and Glaxo at Bedlington, Northumberland (1969). Continuous Pressure filters, which Paxman publicity literature claimed were introduced in response to a demand for a continuous slurry filter which would operate under increased working pressure to achieve a high rate of filtration and improved washing efficiencies. Only two were made, one for use in Paxman's Filtration Laboratory and another as a pilot plant. Because of their very high cost none were actually sold. Total Decanter Centrifuges made by GV-Separation A/S of Copenhagen, Denmark. The main applications for which Paxman sold them were dewatering sewage, filtering industrial effluents and water treatment. In the mid-1980s three large centrifuges were installed by Paxman for sewage treatment at the Coventry works of the Severn Trent Water Authority. Centrifuges for water treatment were sold to the Eastbourne and Wessex Water Authorities. Moving Belt Presses built by Voest-Alpine AG of Linz, Austria, for sludge dewatering. With this type of filter the slurry is fed between two belts of filter medium which subsequently pass between sets of rollers to express the water content. Three were sold, two in 1985 and one in 1987, to H J Banks Limited for coal tip washing on a land reclamation project at Haydock, near St Helens, Lancs. Horizontal Vacuum Band Filters, manufactured by Filtres Philippe of France and designed particularly for multi-stage washing applications in the chemical and pharmaceutical industries. The filter medium is carried on a substantial belt which incorporates grooves and slots for the flow of filtrate. The belt travels across a table and round rollers at each end of the table. A vacuum is applied to the table to draw the filtrate through the medium and the slots in the belt. Although considered to be a very good filter it was expensive which limited Paxman's sales to no more than three or four. Two were sold to British Gypsum for their plants at Kirkby Thore, Cumbria, and Newark. Lasta Presses, made by the Ishigaki Company Ltd of Japan. A key feature was their ability to produce a very dry filter cake. The Lasta press was considered a superb machine and Paxman did conduct site trials for some potential customers. One particular application Paxman had in mind was the disposal of tailings in colliery washeries. Unfortunately the presses were too expensive for the UK market and no sales were achieved. 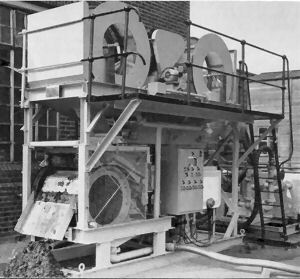 In 1959 Paxman built its first Roto-Plug Sludge Concentrator which was made under licence from the Equipment Development Company of the USA. The concentrator was designed for dewatering sewage sludge with the aim of reducing the volume of solid waste which sewage works had to dispose of. At the time environmental issues were beginning to attract wider public attention and Paxman had high hopes that these concerns would create a large new market for this type of sewage treatment plant. The concentrator comprised two main units, each handling one part of a two stage process. The first unit, the Roto-Plug Thickener, consisted of one or more freely suspended rotating drums fitted with a filter medium on the cylindrical surface. The medium was a continuous filament nylon material of special weave. Sludge was fed continuously into the inside of the rotating drum where initially the water drained away naturally to leave a deposit of solids on the medium. The rotation of the cylinder then caused the solids to form into a rolling mass which further dewatered the deposit through the action of its own weight. At the same time partially dewatered sludge particles were picked off the medium by the rotating mass, an effect similar to that of forming a large snowball. The rotating mass usually built up to about 8" in diameter, its size being regulated by end flanges on the cylinder. As the rolling mass distended along its axis, the end portions were cut away by the flanges and dropped to the second stage. Here the sludge was further dewatered by the second unit, a compression filter. This was built with specially shaped rotors, a lower one with a pervious surface and solid upper floating rollers. 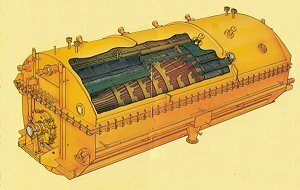 The sludge was fed into compartments in the lower rotor where it was subjected to mechanical pressure by the upper rollers. Photo: Roto-Plug Sludge Concentrator. The top section of this machine has two Roto-Plug Thickener filter drums. Below the left drum is the compression filter. Advantages claimed for the Roto-Plug Concentrator were simplicity of construction, low initial cost, ease of operation, and very low power consumption. In 1964 Paxman released automatic controls for its sludge concentrators, offering benefits in economy if the plant could be run 16 or 24 hours a day rather than the usual 8 hours. By 1966 the plant was capable of processing sludge containing from 3% to 8% solids to produce raw sludge with a 30% solids content. The Roto-Plug Thickener on its own could produce a sludge of 15% solids content. By 1967 Otto Berger and his team were working on a 'second generation' sludge concentrator capable of double the existing output and higher efficiency. An important feature of the proposed new plant was its 'closed circuit' system, eliminating some of the smell and unpleasantness associated with operating the existing 'open circuit' design. In an internal report to senior management dated 13th October 1967 Berger writes that he expects to be able to release details of the new machine in late 1968. No information is currently available as to whether any of the second generation machines were actually made or sold (by late 1968 Paxman had become part of GEC and views of the potential market may have changed). Sales were mainly to local authorities and by the end of 1965 a total of twenty five concentrators had been sold, eleven during 1965 itself. By the end of that year twenty two municipal sludge concentrators had been commissioned. A list of several installations appears as an appendix at the foot of this page. By all accounts the Roto-Plug Sludge Concentrator was not the great success and money spinner Paxman had hoped for or expected. Possibly the market did not expand as rapidly as anticipated, perhaps influenced by other calls on public finance. In the view of one senior ex-Paxman filtration engineer the capabilities of the concentrator were oversold to Paxman by its American designers. Technically the plant was quite basic, a point that cannot be argued when the Company itself emphasized its simplicity of construction. The concentrator work well with raw primary sewage sludge, but not with some other sludges. A major weakness was the lack of any effective facility for cleaning the filter medium which was particularly prone to becoming clogged when handling greasy sludges such as those from abattoirs and some other commercial sources. The major component of a Paxman rotary vacuum filter is the filter drum. This is basically a cylindrically shaped frame designed to carry the filter medium (cloth) which is attached to its outer surface. The inner surface is divided into rows of cells to which a vacuum can be applied or shut off in sequence as the drum rotates. The drums are of two types, deep cell and pipe. The latter's steel shell has perforations connected to internal pipes for the vacuum and for filtrate draw off. Above the perforations are attached plastic grids or mats (decking) which support the filter cloth. Until the late 1940s, when all-welded filters came in, the drums were iron castings produced in Paxman's own foundry. These were obviously very large and heavy, requiring large quantities of molten iron and posing a real challenge to the foundrymen. Paxman did not have facilities for casting stainless steel so a small number of cast stainless drums were bought in for filters supplied to the Boots Pure Drug Co. The largest cast stainless drum, 8' diameter with a 12' wide face, was for a 300 sq ft filter for the manufacture of the antibiotic, Aureomycin. However the vast majority of Paxman stainless steel drums were of fabricated construction, made in-house. The second main component is the trough which is fed with the slurry to be filtered. Where appropriate the trough is fitted with an agitator to maintain the solids in suspension. The lower section of the filter drum rotates within the trough, so that usually about 30% of the drum's surface (filter area) is submerged in the slurry at any time. Deep submergence filters, used for a few specialised applications, may have as much as 50% to 60% of the filter area submerged. As the drum slowly rotates a vacuum is applied internally to those cells which are submerged (the Pickup Zone). This draws the liquid element of the slurry through the filter medium and a cake of solids builds up on the medium's outer surface. Inside the drum the filtrate flows through an arrangement of cells and pipes to the valvehead and then to a storage tank. As cells emerge from the slurry, vacuum is maintained on them both to remove as much moisture as possible from the cake and to hold the cake on the drum until it is ready to be removed or discharged. How the cake is removed is explained next. Scraper Knife: This is considered the best general all-round option. An angled blade (knife) along the front of the filter is set very close to, but not touching, the filter medium. As the cake on the drum approaches the edge of the knife, it is lifted about 1/8" off the filter medium by air blow (sometimes referred to as blow-back) at a pressure of about 1 to 2 psi. The cake then travels across the upper surface of the knife which guides it away from the filter until it falls, for example, onto a conveyor belt to be carried away. String Discharge: The simplest and cheapest mode. A large number of string loops, each passing around the circumference of the drum and over a roller at the front of the filter, are distributed about ½" apart along the length of the drum. During the filtration process the cake forms on top of the strings. When these approach the roller at the front of the filter, they lift the cake off the drum, and cake falls off the strings as they travel round the roller. A comb placed near the roller maintains the even distribution of the strings along the drum's length. Belt Discharge is a later and more sophisticated version of String Discharge. A belt of the filter medium passes round the circumference of the drum and over rollers at the front of the filter. As the belt travels round the tight curve of one of these rollers the cake falls away. A key feature of belt discharge is an arrangement for washing the belt between the stages of cake discharge and commencement of the next filtering cycle. This is essential if the belt is to function effectively during the next cycle and is achieved by spray bars running the length of the filter which play on each side of the belt. Precoat with Shave-off Knife: The preferred mode for filtering slurries with a very low solids content and where an exceptionally clear filtrate is required. In this case the filter medium is an expendable layer of diatomaceous earth (Kieselguhr) or a similar material like perlite built up over a conventional filter cloth. In operation every time the drum completes a revolution the shave-off gear moves a small distance closer to the drum. The continuous shaving away of a very thin layer of contaminated earth prevents the filter becoming 'blind' (i.e. clogged) and exposes a clean filter surface for the next cycle. The depth of cut or shave off is typically about two thousandths of an inch. The maximum depth of the precoat at the start of filtration is about 4" which may be sufficient for the filter to be run continuously for three or four days or more. When about only 1/8" remains it becomes necessary to stop the process and rebuild the precoat. This is done by filtering a slurry of the earth and water without, of course, any discharge. The size of a filter is normally expressed in terms of its filtration area, by which is meant the effective area of the filter medium, measured in square metres (m²) or square feet (sq ft). A good general indication of sizes of Paxman rotary vacuum filters can be gained from those quoted in one of the Company's 1980s brochures. At that time seven standard types were offered, ranging from 1m² to 121m² (10.76 to 1,300 sq ft), with filter drum diameters from 750mm up to 3,950mm (approx 2' 6" to 13'). The overall dimensions of the smallest rotary vacuum filter were 1,100mm (wide) x 1,050mm (high) x 1,250mm (long) and of the largest 4,500mm x 4,380mm x 12,000mm (approx 3' 7" x 3' 5" x 4' 1" and 14' 9" x 14' 4" x 39' 4"). In another brochure the Company offered sizes up to 150m² (1,600 sq ft). The largest Lubemaster filter weighed over forty tons. These facts may help to give some idea of the facilities and skills required to build the larger sizes to the tolerances required. In practice the design and manufacture of industrial filtration plant is rather more complex than the brief overview above might suggest. Many of the challenges arise from the widely differing characteristics of slurries. For each application the particle size, quantity, and properties of the solids involved have to be carefully assessed to decide what type of filter will be most suitable, what filter medium should be used and which discharge mode will be most effective. Engineering skills of a high order are called for in the design of components like the valvehead and the drum with its internal pipework, vacuum and cell arrangements. The valvehead, for example, has to control the application of vacuum to the cells in the filter drum and provide for the flow of filtrate from the drum. The location of the valvehead, in contact with the rotating drum, required the development of a special system of bearings and seals. It should also be borne in mind that the filter itself is only part of a complete installation. The designer has to specify and arrange for other parts of the system, such as feed and vacuum pumps, which must be carefully matched to the size of the filter and the particular application. On the manufacturing side the building of large filters at Paxman was undertaken with impressive craft skills. 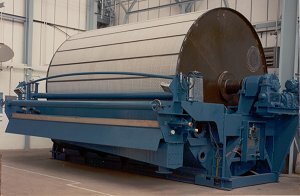 It was no mean feat for platers to roll steel plate (up to 3/8" thick) into perfectly concentric drums up to 13' or more in diameter using only a basic horizontal roll. Again, to achieve the required accuracy of alignment along a drum up to nearly 40' long demanded real skill. Then there are the challenges of adapting basic designs to meet a wide range of special requirements. For instance in food and pharmaceuticals production the need to avoid any contamination of the product calls for the construction of filters in materials such as stainless steel, high density plastics, or epoxy coated steel. In other applications the filtrate is highly corrosive, again necessitating the use of special materials. As described in more detail below, the use of volatile solvents in the oil dewaxing process requires a filter which is totally enclosed and incorporates additional features to minimise solvent loss. These few examples further illustrate the substantial engineering knowledge, skills and capabilities involved and which earned Paxman its reputation for manufacturing high quality, efficient and reliable rotary vacuum filters. The following sections on this page describe, by industry sector, some of the main applications and orders for Paxman filters. They do not attempt or pretend to be a full record. The intention is to provide a representative picture of uses of Paxman rotary vacuum filters and the customers to whom they were sold. Reference has already been made to the important role played by Paxman plant during World War 2 in the recovery of coal fines at colliery washeries. The coal industry remained a major customer, producing some large orders, right up to the mid-1980s when it started its major decline. Among the many collieries supplied with Paxman filtration plant were Dinnington and Thurcroft in South Yorkshire, South Kirkby in West Yorkshire, Kellingley in North Yorkshire, Manton and Shireoaks in Nottinghamshire, and Shirebrook in North Derbyshire. Photo: 600 sq ft filter as supplied to some Yorkshire collieries. In 1973/74 four filters of 22' 9" overall length x 8' diameter, were supplied to the National Coal Board's Horden Colliery where they were able to reclaim up to 1,000 tons of usable coal per day. The largest ever coal industry order was for sixteen 600 sq.ft filters for the NCB. Each of these weighed 21 tons and measured 27' long x 12' high x 12' wide. All were installed at Grimethorpe Colliery in Yorkshire by the end of 1982. Probably the last major order from the industry, with a value of £270,000, was placed in 1986. 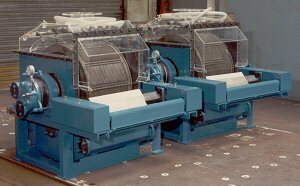 This was for four large rotary vacuum filters, delivered in 1987, for Harworth Colliery in Nottinghamshire. Another important customer during the 1970s and 1980s was the oil industry. The requirement was for a method of removing heavy petroleum wax found in the feed stock from which lubricating oil is produced. The process involves the use of volatile solvents which are added to the oil stock to dissolve the wax. The oil is subsequently cooled until the wax crystallizes out at low temperature (-20°C), at which stage it is removed by filtration. In this application of the rotary vacuum filter it is essential to reduce solvent loss to an absolute minimum for reasons of health and safety and environmental protection as well as cost. To meet these special demands Paxman developed its Lubemaster and Lubemaster 2 de-waxing filters which were totally enclosed by vapour-proof hoods. Paxman's first de-waxing filter, 315 sq ft, was ordered in 1965 by Matthew Hall for Lobitos Oil at Ellesmere Port. This was followed in September 1969 by an order for a 1,000 sq ft de-waxer for Shell's Stanlow Refinery and in April 1970 by orders for six 750 sq ft filters for BP's Llandarcy Refinery in South Wales. A further order, placed in 1971, was for a 1,000 sq ft filter for Mobil's Coryton refinery at Stanford-le-Hope, Essex. These successes in the British market paved the way for important export orders. In 1973-74 ten 1,000 sq ft dewaxing filters were supplied for the Petro-Bras refinery in Brazil. Because of the size of the order some were built by GEC companies at Stafford and Trafford Park as well as Colchester. (Paxman became part of the GEC Group in 1968). At the time of start up, the Brazil project was the biggest lubricating oil extension to an existing plant in the world. Picture: Cut-away illustration of a Lubemaster de-waxing filter. Three 624 sq ft de-waxing filters were ordered by National Refinery Ltd of Pakistan in late 1982 and installed at Karachi in 1984 prior to the plant's commissioning in 1985. For this project Paxman additionally supplied two or three de-oilers. Another order placed in late 1982 was for an 800 sq ft de-waxer for the Shell Oil Company's Deer Park refinery near Houston, Texas. Three 1,000 sq ft de-waxing filters were ordered in November 1984 for the TÜPRAS (Turkish Petroleum Refinery Corporation) refinery at Aliaga, north of Izmir. These were additions to de-waxing plant already installed at Aliaga. In late December 1986 Paxman Filtration won a US$1 million order for de-waxing filters for China. The order placed by Sinopec, the State Oil Corporation of China, was for three 55m2 filters for a refinery at Maoming in the south and two 30m2 filters for Dalian Refinery in the north. The larger filters weighed about 35 tons each. All five were delivered during the latter part of 1987. In November 1987 another contract was negotiated with Sinopec, this time worth US$1.135 million, for five 50m2 Lubemaster dewaxing filters. They were for Ta-Qing, 700 miles north of Beijing, the most northerly refinery in China. The last de-waxer to be built by Paxman is believed to be a 1,000 sq ft filter supplied to Mobil's Notre Dame de Gravenchon refinery near Caudebec, Normandy, France, where it was installed in 1988. One water treatment application was the filtering of spent lime slurries. Among Paxman filters supplied for water treatment was one to Shell's Stanlow plant for treating boiler water and another to North East Derbyshire Water Board's Lowtown treatment works at Manton, Worksop. The latter treated raw water drawn from underground at Manton colliery. Installations of rotary vacuum filters for sewage treatment included those at West Kent Sewage Works (Dartford, Kent), Parr Treatment Works (St Helens, Merseyside), and Dingwall (on the Cromarty Firth). A mid-1950s Paxman catalogue has a picture of two 300 sq ft filters at the West Kent Works for dewatering digested sludge. These are perhaps the two ordered in April 1937. A further 300 sq ft filter was ordered for Dartford in May 1953. The St Helens plant was ordered in 1969. For sewage treatment Paxman later supplied centrifuges under licence from GV-Separation A/S of Denmark. Filters were supplied for the production of both heavy and fine chemicals. From the late 1940s right up to the 1980s a major customer was ICI (Imperial Chemical Industries). Orders from ICI included one in 1983 for four 61 sq ft stainless steel filters to handle soda ash at its Lostock plant in Cheshire. Three more 61 sq ft stainless steel filters were ordered in 1985 for sodium bicarbonate manufacture at ICI's nearby Winnington site. Paxman supplied well over thirty rotary vacuum filters for processing titanium dioxide. Most were of the 300 sq ft size and constructed of rubber covered mild steel. With a few exceptions they were ordered between 1968 and 1987 by Tioxide UK Ltd and its predecessor companies for their Grimsby and Billingham plants. Filters were also specially designed and built for the pharmaceuticals industry where the highest levels of purity are required with no risk of contamination. This necessitated the use of special materials, such as stainless steel, high density plastics or coated steel, in their construction. They were supplied to such well-known names as Boots Pure Drug Co, GlaxoSmithKline, Dista Products (now Eli Lilly) at Speke, Merseyside and May & Baker. Photo: Two 10 sq ft filters for GlaxoSmithKline. In food and drink applications, as in pharmaceuticals, it was generally necessary to use special materials in the construction of filters to ensure purity and non-contamination of the product. Paxman supplied rotary vacuum filters for use in the manufacture of a diverse range of foodstuff products such as glucose, gluten, dextrose, starch, hydrolysed protein, and fruit juices. Among those purchased for glucose duties by CPC Ltd (formerly Corn Products Company Ltd, the Industrial Division of Brown & Polson Ltd) of Trafford Park, Manchester, were seven ranging in size from 300 to 400 sq ft. Ordered between 1974 and 1979, these were all of the pre-coat type. Several filters were sold to major potato crisp manufacturers for handling potato starch. Another important food application was sugar production; filters being supplied for recovering sugar juice in cane processing plants overseas and sugar beet factories here in the UK. For the brewing industry a specialised type of yeast filter was developed. Orders included those from Whitbread (London 1956, Luton 1971, 1974), Scottish & Newcastle at Edinburgh (1969, 1973, 1975), Greenall Whitley at Warrington (1973, 1977), Northern Clubs Federation Brewery at Newcastle upon Tyne (1976), Trumans (1970) and Bass Charrington at Burton-on-Trent (1965, 1966, 1971). Those ordered after 1970 were all of the pre-coat type. Yeast filters were constructed of highly polished stainless steel and had to be entirely free of crevices. This was to facilitate thorough cleaning between process runs and prevent yeast infections from previous batches. A major market during the early days of Paxman's filtration business was gold mining. Between 1933 and 1939 thirteen filters were supplied for filtering cyanide slimes, with a further two being ordered in 1945. The first two were for Australia. The remainder were for either South or East Africa with the exception of two for Ghana (1939). They ranged in size from 200 to 700 sq ft, with nine of the fifteen being 700 sq ft. One wonders whether it is purely coincidental that Paxman supplied substantial quantities of machinery to African gold mines in the late 19th century or whether contacts had been retained which assisted the sale of its filters into this market. Later on in the Filtration Division's history, precious metal refining provided another important customer. Johnson Matthey are well known for processing metals such as platinum. This company, which had ordered a filter for Palladium catalyst duties in 1961, ordered a further twenty filters between 1968 and 1981. They were for various duties and with two exceptions were of the 10 sq ft size. All but one were built for Johnson Matthey's Royston, Hertfordshire, plant. One of Paxman's biggest single customers for rotary vacuum filters between 1948 and 1960 was the Cellulose Development Corporation of Hatch End, Middlesex, a private company sometimes known as Celdecor. During that period they placed orders for over 80 filters for paper pulp duties. Many of these were for export, mainly to Holland, Italy, Poland, China, Algeria and India. Paxman also fabricated cellulose digestion towers and related items of plant for Celdecor. Paxman became a leading authority on filtration, widely known and respected for its knowledge and expertise in the field. A good part of this was due to the business's laboratory, its chemists, its pilot scale and mobile evaluation units. For many years the work of the laboratory was led by Tony Warren who started working for the filtration division as a chemist in 1948. He later became Chief Chemist then Chief Filtration Engineer, clocking up over forty years service and earning a well-deserved reputation for his great knowledge and practical experience of the chemistry of filtration. The pilot scale and mobile evaluation units enabled trials to be carried out on customers' sites thus providing valuable information based on real operating conditions to supplement that obtained in the laboratory. The Company was almost unique in the facilities it offered for conducting practical tests and trials. Experimentation and trials were generally the only reliable methods of determining the most effective solution to any particular filtration problem. Paxman's capabilities and experience in this area were so highly regarded that people approached the Company to conduct tests even if they had no intention of purchasing its filters. Consequently it became necessary for Paxman to start charging for a service it had previously offered free as part of its sales promotion. In some cases the tests undertaken by the Company showed that the best filter for a particular application was of a type not offered by Paxman itself. It was this factor which led Paxman in the mid-1980s to seek licensing agreements to market other types of filters produced by overseas manufacturers as discussed earlier on this page. A section of the Chemical Plant Sales Handbook, produced by Paxman for its sales staff in the mid-1960s, gives details of the business's main competitors. At the time these were Dorr-Oliver & Co, Stockdale, Eimco, International Combustion and Unifloc. Also summarised in the Handbook were the perceived relative strengths and weaknesses of the competitor companies and their products, together with guidance on how sales staff should deal with these in discussions with potential customers. Up to this time Dorr-Oliver, a long-established concern whose products had always been considered the Rolls Royce of filters, had been the main competitor. By now it posed less serious competition as Paxman offered lower prices. The most serious competitor had become Stockdale which frequently offered cheaper prices and had a very efficient and competent sales force. Here Paxman's advantage lay in a better engineered product; Stockdale filters were in some respects less robustly constructed, giving rise to reliability problems. In the South Wales coalfields Unifloc was difficult to compete with as it was able to supply complete coal preparation plants, unlike Paxman which could offer only part of the plant. Nearly forty years later the names of Dorr-Oliver and Eimco survive as leaders in the field of filtration. In 1991 the Paxman filter range was purchased by Eimco of Rugby. In 2002 Eimco merged with Dorr-Oliver to form Dorr-Oliver Eimco, which is now FLSmidth Dorr-Oliver Eimco UK Ltd. In early 1989 Paxman decided to dispose of its Filtration Division. No doubt a number of factors influenced the move. Key among these was the lack of any natural fit between filtration and Paxman's core diesel engine business. There were no strong links between their technologies, markets, or manufacturing methods. Selling the filter business would free Paxman to concentrate fully on its diesel activities. Another drawback of the filter business was the irregular nature of order inflow, not uncommon to manufacturers of capital plant. For cash flow and shop floor workload it was either feast or famine. Then there was the large amount of space required for manufacture when orders for multiple filters were received, space which might otherwise lie idle but still attract overhead costs. Finding space to fulfil larger orders also tended to be disruptive to the Company's diesel engine manufacturing. Another factor may have been the downturn Paxman experienced in its diesel market at this time, resulting in redundancies in 1988 and 1989. Selling the filtration business would allow greater scope for site rationalisation, further reduce the size of the workforce, and bring in some cash. The final piece of the jigsaw was a potential suitable purchaser, a local company whose core business was filtration but which lacked rotary vacuum filters in its portfolio. Brackett had operated in Colchester for many years and the location of their new factory on Severalls Lane would make it feasible to transfer Paxman's filtration staff with their specialist knowledge and skills. The sale of Paxman Filtration to Brackett was completed towards the end of April 1989 when the majority of Paxman's filtration staff became employees of Brackett and moved to the Severalls Lane factory. Only a couple of years later, in 1991, Brackett sold its Paxman filter business to the Eimco Process Equipment Company, which became part of Dorr-Oliver Eimco. Subsequently the company was acquired by the GLV Group (Groupe Laperrière & Verreault Inc of Canada). In August 2007 Dorr-Oliver Eimco changed hands again when it was acquired by FLSmidth Minerals and became FLSmidth Dorr-Oliver Eimco UK Ltd. The company now trades as FLSmidth (UK) Ltd.
FLSmidth (UK) Ltd, based at Rugby, offers spares and service support for Paxman Rotary Vacuum Filters and can manufacture new ones if required. It is arguably the best qualified business to offer this support, possessing the relevant technical knowledge, experience and facilities. As explained above, FLSmidth is the successor company of Eimco, which purchased the Paxman product range back in 1991, and of Dorr-Oliver, both of which were long established and well-respected manufacturers of rotary vacuum filters. 1. Paxmans' World, Issue 4, May/June 1983, p 9. The listing below was compiled from memory by John Potts who from 1968 to 1989 was Paxman's Service Engineer covering the north of England and Scotland. The list broadly runs from north to south and is not claimed to be complete. Most installations comprised multiple units. Service support for those in southern England was provided by personnel from Paxman's Colchester works. Jaywick, Clacton-on-Sea, Essex - completed late 1964/early 1965. Chertsey, Surrey - in cooperation with Egham UDC. Installed March 1967. Acknowledgements: My thanks for their invaluable help to the following former members of Paxman Filtration's staff: Ian Mactaggart, Engineering Manager then Divisional Manager; the late John Potts, for many years the Company's Service Engineer based in Yorkshire; David Poppleton, Contracts & Service Manager; Tony Warren, Chief Chemist then Chief Filtration Engineer; Keith Thompson, Senior Filtration Engineer. Also to John Nevard of Paxman. They are not responsible for any errors or inaccuracies which may appear on this page !